These three works are representative of the polyphonic style prevalent in the 15th century and are excellent examples of that hallowed time. Costanzo Festa's 'Lamentations' are beautiful works full of romance and mystery and permeated with classic polyphonic overtones that are reminiscent of those far off days of monks and monasteries and large vaulted churches. I have already heard and reviewed much music by Johannes Ockeghem and this beautiful Requiem is further evidence of the capabilities of this excellent composer. 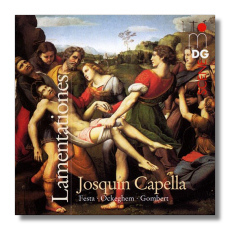 The Josquin Capella manages to convince that small is beautiful and they make quite an intriguing sound with their seven voices. The short motet by Nicolas Gombert is a fitting end to this well sung disc. Recordings are quite fine with the voices sounding clear and direct whilst Bruser directs with evident empathy for this music.